Also known as the golden work triangle, the principle developed in the early 1940’s, was designed to maximise efficiency between the most used spaces in the kitchen – the oven, sink and fridge. The kitchen work triangle is a beautifully simple idea, placing emphasis on the primary tasks carried out in the kitchen, preparation, cooking, clean up and food storage. We’re not saying that the idea is a law, but merely a principle used for good space planning. According to the National Kitchen & Bath Association NKBA, the kitchen work triangle is a set of imaginary lines that make up a triangle between the three most used areas. It advises that the sum of these three lines should not exceed 8 metres and that each line should be between 1.2 and 2.7m. This triangle should not be impeded by other kitchen items such as kitchen islands, cabinets or tables. This reduces cramping of furniture in the kitchen and maximises traffic efficiency so that the cook isn’t interrupted. A lot has changed since the early post war years when the principle was developed, when domestic kitchen design centred around lots of assumptions that are no longer relevant. Lives nowadays have little in common with traditional social conventions back in the 1940’s, mothers are now working full time and couples, fathers and young adults cook together. Kitchens now have to satisfy the needs of several users, handling new cuisines, different food preparation methods and changed eating patterns. Technological development has also been rapid – kitchens now boast a wide range of state of the art devices which previous generations could only dream of. Because of this, the work flow triangle is no longer the only guiding principle for kitchen design, however you can’t argue the logic of the ergonomic design principles. Although we’ve examined the outdated assumptions of the work triangle, there are still many relevant parts of the principle that are still used today by kitchen designers. At Mudd & Co we adopt a range of ideals, that yes, space should be maximised to form the most efficient movement around the kitchen – it makes the space easier and more enjoyable to cook in. 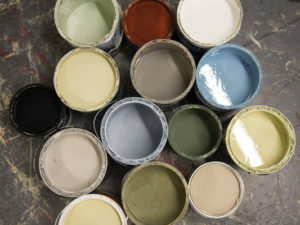 More importantly though, we believe that your lifestyle determines the functionality of your kitchen. After all, there are lots of factors that contribute to good kitchen design. We briefly spoke about the changes in social conventions of the 1940’s and today’s modern life – kitchens are now the hub of family activity, no longer a place to just cook and eat. 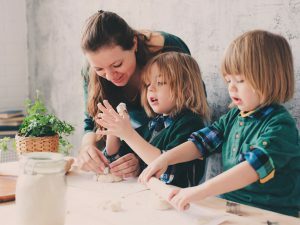 Families are working at their dining table, watching tv in open rooms, complete homework in the evenings and weekends, and enjoy crafting activities. In larger kitchens, additional preparation areas are favoured or sofas and relaxation areas are integrated. Kitchens in pre war times were much smaller, space was at a premium, there was no need or possibility of zoning different areas of the kitchen according to activity. There was only one primary task – cooking. Designing according to work flow areas is exactly that, splitting a kitchen into smaller areas according to the regular activities that take place there – entertaining, cooking, working etc to avoid them interfering with one another. Considering the range of activities conducted in your kitchen can help with the initial layout, when redesigning or starting a kitchen from scratch. Does the Work Triangle Work on Different Kitchen Shapes? 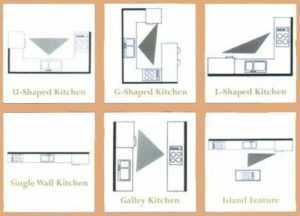 No matter what the shape of your kitchen, whether U, L, G, galley or other, there’s probably a work flow triangle somewhere if you looked at the layout. So it turns out that all that geometry you thought was useless at school finally came in handy doesn’t it? If a streamlined workflow is what you’re after, get researching equilateral triangles….we’re kidding, it’s not that scientific. An efficient work triangle is usually evident in a U-shape kitchen – with seperate and ample areas for preparation, cooking and clean up. Usually holding two large appliances on one side and a third on another, the L-shaped kitchen has an efficient work flow triangle. 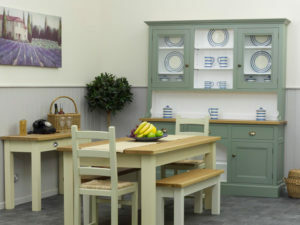 Try to keep the sink between the cooker and fridge to maximise efficiency and don’t forget about ample workspace. Operating with a tighter work flow, galley kitchens are perfect for single chef households, with little movement or energy expenditure, the user can navigate between the busy areas within a few steps. If all of your appliances are neatly packed onto one wall because of space and size limitations, ensure you have adequate counter space for preparation, cooking and clean up. We encourage our customers to think outside of the kitchen work triangle by considering their existing space and appliances to produce the most functional kitchen for them. As we a specialise in freestanding kitchens and furniture we often have lots of customers who choose full height freestanding larders rather than additional pantry rooms – this works in line with the work triangle by allowing dry food and stored goods to be located right next to the fridge for easy access and efficient movement around the kitchen, Similarly, locating the sink, bin and dishwasher in close proximity or the cooker and utensils or pans is all intuitive with the principle. 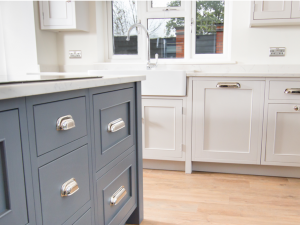 If you’re ready to talk about your kitchen design or how you could integrate freestanding kitchens into your house, contact our helpful designers on 01538 380 988 today.